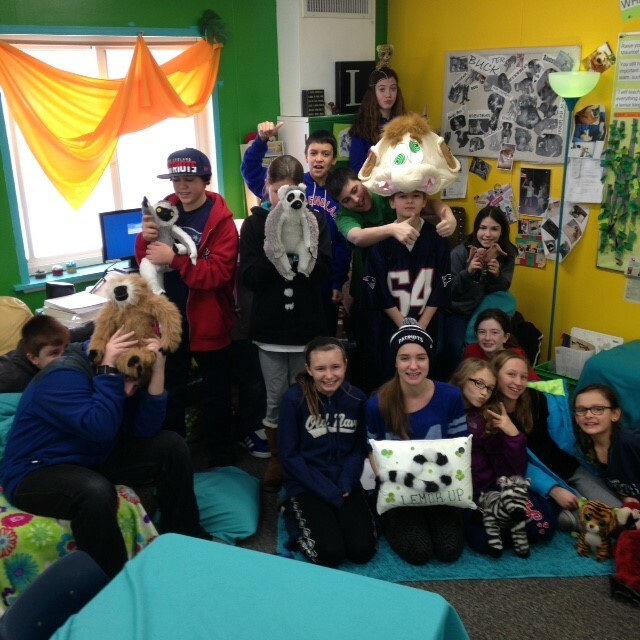 Teacher Robin Lee’s class is spending the whole school year using a lemur-based curriculum. Last July, sixth grade language arts teacher Robin Lee went to the IMAX theater, knowing little about lemurs and Madagascar, and not even aware what was playing that day. She was in for a treat. On the screen was Island of Lemurs: Madagascar. The movie—and its furry co-stars—inspired her. As a teacher, she knew her students’ curiosity would be piqued by these fascinating animals and their unique home. Coming out of the cinema, I was still in awe of the movie: content, cinematography, and most importantly, the cause, raising awareness of the lemur plight. The students would be enthralled with these cool creatures, and most importantly, would be catapulted into environmental and ecological awareness. The students enter a room thematically filled with lemur books, rainforest vines, tropical colors, lemur pictures, Madagascar movie posters, stuffed animal lemurs, and more….all LEMURIZED! The response is excitement and curiosity. Thus began our year of Learning thru Lemurs. How exactly is a class lemurized for a whole school year? 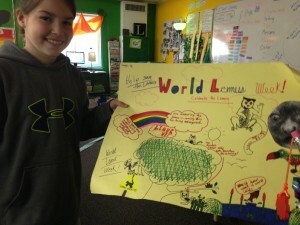 The students made posters for World Lemur Week. 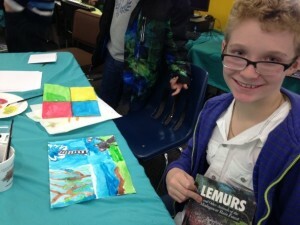 Students read books about lemurs, made lemur artwork, and more. It’s hands-on, project-based, problem-solving, real-world, not a bunch of worksheets, and it’s learning that makes a difference. 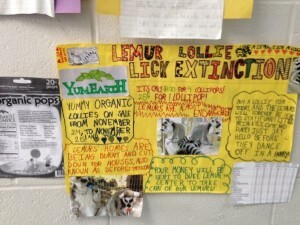 As an educator, I am thrilled with all of the above and the amazing amount of engagement that students have exhibited this year, all due to passion-based learning and LEMURS. Students have not only learned many ELA Common Core concepts during this year of the lemur, but more importantly they have begun their journey toward becoming global citizens. Team Lemur has held several fundraisers at their school, raising money for the Duke Lemur Center and Lemur Love. 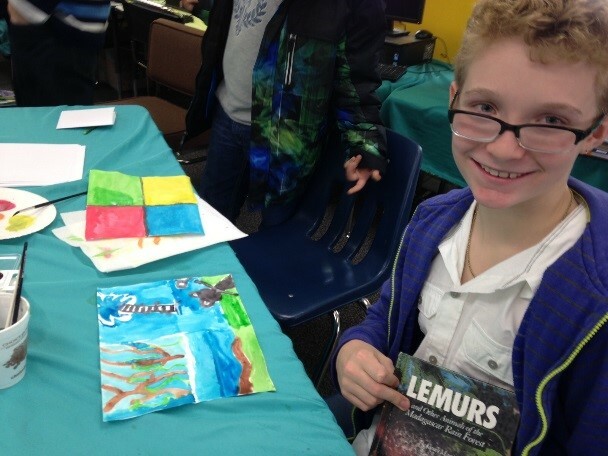 Team Lemur is so enthusiastic about lemur conservation that they have organized several fundraisers, and the school year’s not even over yet! So far, they have raised $150 for the Duke Lemur Center — enough to symbolically adopt three lemurs from the center. These symbolic adoptions are perfect for an educational group, because they come with a lemur adoption kit with more information for the kids to learn about lemurs. Inspired by their fundraising success, the class planned more fundraising activities. This time, they sold 225 bags of popcorn to support Lemur Love, raising $200! The kids love the fundraisers too, because they are taking action for a cause they care about! They are raising awareness, and at such a young age, they are able to make a difference. At the Lemur Conservation Network, we love to hear about education initiatives like this, where students are engaged, and their teachers are passionate about helping their students become active global citizens. We need everyone’s help to conserve lemurs! We’ll be following this 6th grade class through the remainder of the year, and we will be sharing some of teacher Robin Lee’s lesson plans and activities focused on lemurs, so that you too can learn through lemurs!